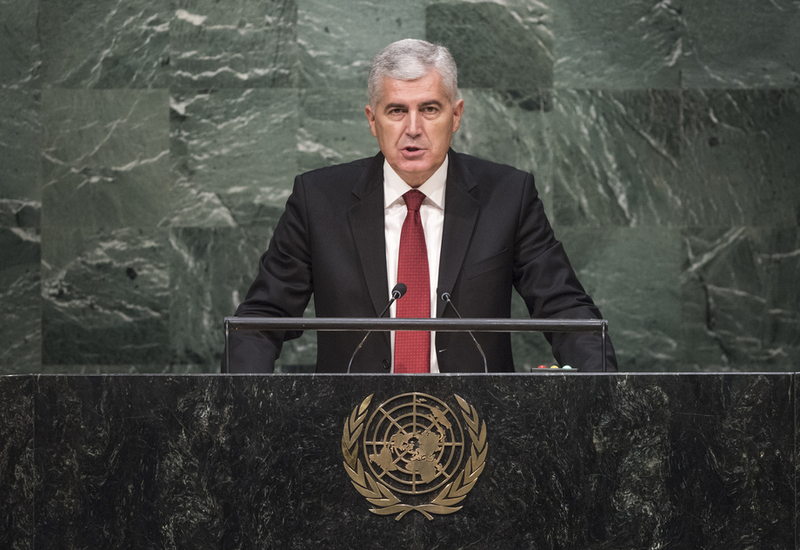 DRAGAN ČOVIĆ, President of Bosnia and Herzegovina, said that, until recently, the crisis in Syria was largely a Middle East crisis. However, several days ago, Syrian refugees had arrived at the borders of his own country, reminding its people that, in the modern global environment, the events of another place and another region were closely intertwined and inseparable from the events at his country’s borders. The waves of refugees presented a large burden for the majority of countries to which they were arriving. The tragedy of innocent victims, especially and unforgivably of children, was a test to the international community to take action. He expressed concern at the deterioration of the Syrian conflict, which presented the most serious threat to international peace and security. It was essential that the political transition in Syria was conducted in accordance with the Geneva communiqué. Regarding the situation in Ukraine, he also voiced hope that the conflicted parties would adhere to the peace agreement. Terrorism and violent extremism were by far the most serious challenges the world faced today, he said. The ideology characterized by absolute disregard for life was seriously undermining the fundamental values and achievements of civilization. His country, a member of the Global Coalition to Counter ISIL [Islamic State in Iraq and the Levant], led by the United States, supported the work of the counter-terrorism community in its work to empower individual Member States. There needed to be a comprehensive strategy and holistic approach in order to address the root causes of terrorism, including addressing poverty and providing education to younger generations. He welcomed the extremely important agreement on the Iranian nuclear program, noting that the historic agreement was evidence of the true superiority of diplomatic efforts, and could be a guideline for solving other crisis situations. The United Nations was a guarantee of collective security, and his country endeavoured to pass on its best experience in peacebuilding and democratic transition, particularly through membership in the Peacebuilding Commission, he said. Bosnia-Herzegovina contributed in the most direct way to maintaining and building world peace by participating in peacekeeping missions around the world and providing a significant number of female peacekeepers. Women were the pillar of the family, as well as the carriers of the development of a society, and a major factor in reconciliation. In light of what his country had been through, his Government would therefore invest even further efforts in women’s interests to mend what was broken, strengthen the pillar of the family, and provide for women’s equality. Exactly 20 years ago his country had achieved its long desired peace, he said. Now they were working to improve social conditions and rule of law. The next step was to submit its membership application to the European Union, and continue to build a society of equality and parity. Experiences and lessons learned in the past must be offered as an increased contribution. His country would spare no effort in combatting all forms of discrimination and intolerance, as was written in its constitution. It was a small and complex multi-ethnic State, he said, stressing that his Government knew exactly how important it was to protect all individual and collective rights. He also underscored the importance of reaching a legally binding agreement at the upcoming twenty-first session of the Conference of the Parties to the United Nations Framework Convention on Climate Change in Paris.